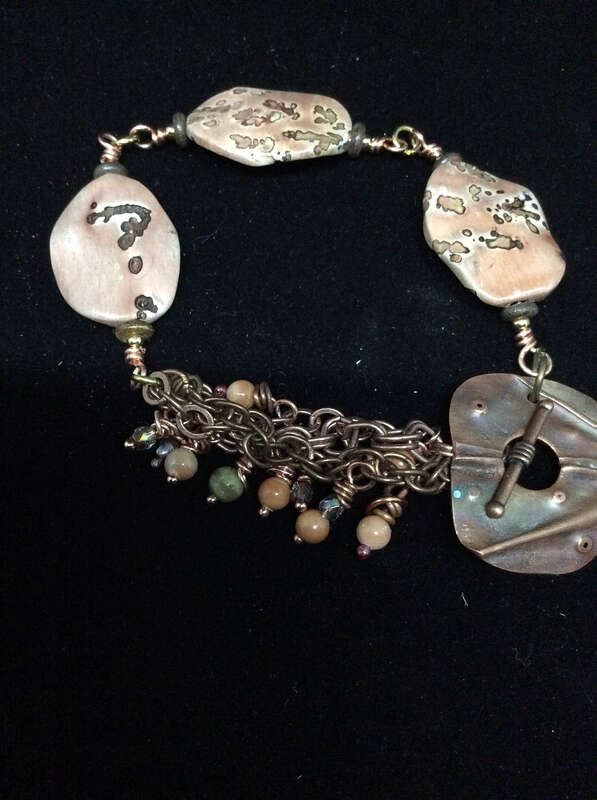 Jasper link bracelet with vintage copper and brass chain, tiny dangles and copper fold formed handmade toggle clasp. 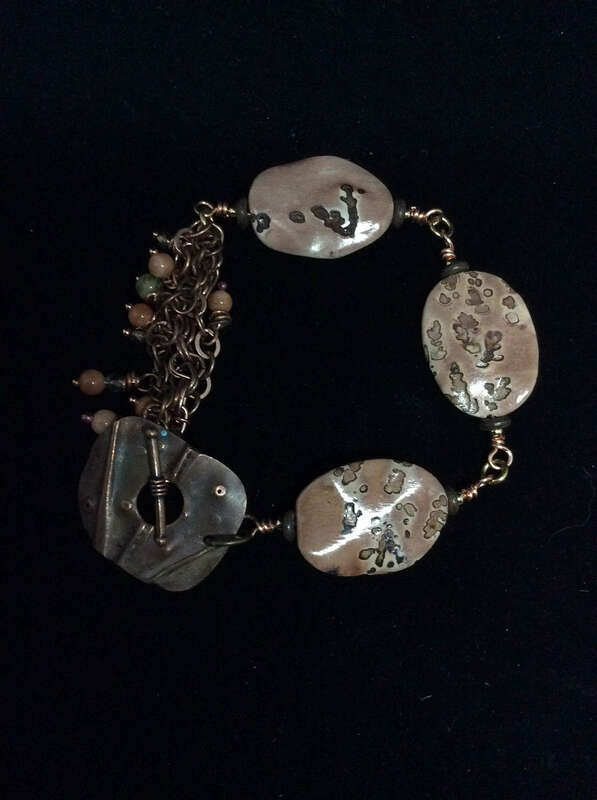 Jasper wire wrapped organic stone bracelet surrounded by tiny wood rondelles and brass balls. The stones are joined by 3.5mm jump rings to form a comfortable wearing bracelet. 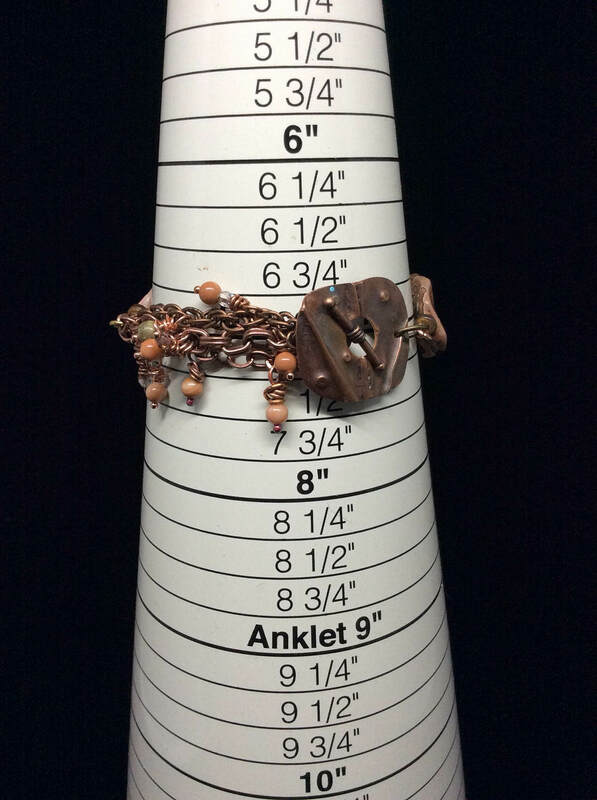 One third of the piece has three pieces of vintage antique finish copper chains; each chain is different and has numerous tiny dangles of wire wrapped crystals and 3mm jasper round stones. The bracelet closes with a handmade organic fold formed and distressed square of copper to form a secure toggle clasp. The bracelet fits a 6 3/4"- 7" wrist. Remember, shipping is free! 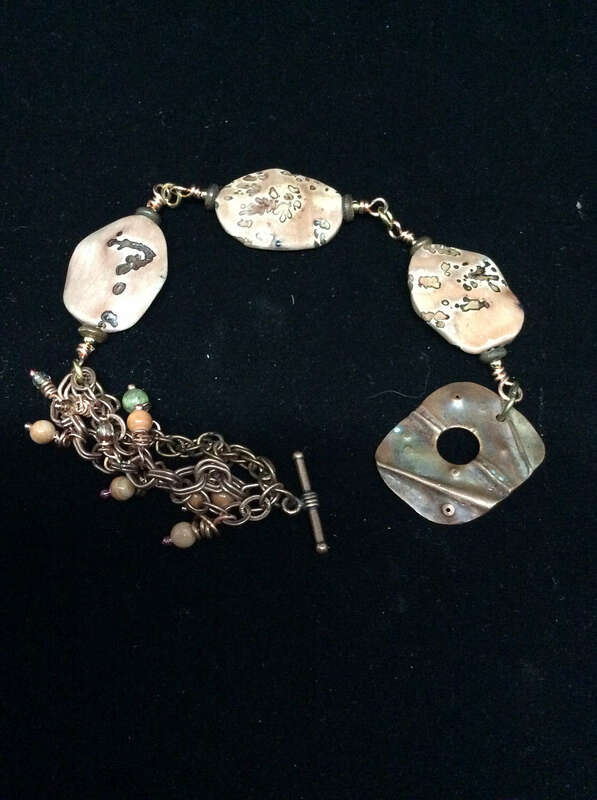 Everyone is sure to notice this unusual organic bracelet with a Bohemian flair. They'll envy your love for OOAK artisan created pieces, your independent spirit, and your desire to be set apart from mass produced jewelry. You'll have a fresh aura about you; one who delights in artistic adornments. Your bracelet will arrive in a shiny black box with a gold elastic bow so you can examine the bracelet before gifting it. If you'd like it send to another address with an enclosed personal message, I'd be happy to do that. Another great perk I offer is free repairs for the life of the piece providing you pay for all postage. After the third or fourth repair, I may inquire what you are doing when wearing bracelet! Thanks for visiting Jesco Jewelry and I look forward to hearing from you soon!